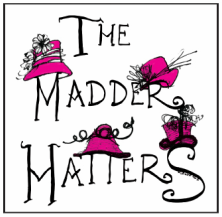 The Madder Hatters – Diana Niles King and Belle McIntyre – hand make, trim and sew all of their creations in the studio workroom. Depending on the season, the collections are made up in felt, fur, Panama straw, sinemay, Milan, Starbrite and horsehair. All sorts of wonderful things – ribbon, veil, feathers, seashells, flowers and bird’s nests, are used to trim up the Hatter’s creations. Each hat is one of a kind and specially named to capture its special vibration. Sign up to receive our newsletter containing upcoming events, hot styling tips, our newest creations and much more!